You don't need special plans for sprouting containers. Sprouting seeds is so simple that you can use recycled containers you may have around the house to sprout everything from fresh mung beans to broccoli sprouts. Making a sprouting container at home takes about ten minutes. There's no need for special plans for sprouting containers or even fancy kits. Just gather your materials and jump right into seed sprouting. One tip is to only buy seeds specially marked for sprouting. These should be free from coatings or other substances to help seeds germinate, which may be included in packets purchased from garden centers intended to raise vegetable crops. Seeds packaged for gardeners may be treated with chemicals to lengthen the shelf life or help them sprout. To avoid this, only use seeds packaged and marked for sprouting. There are many types of sprouting seeds available. 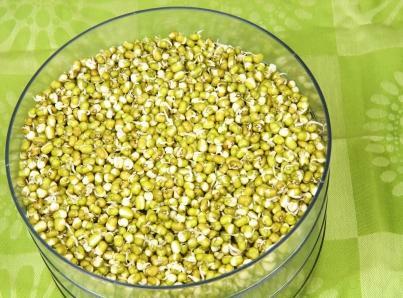 Mung beans, alfalfa sprouts, broccoli sprouts and radish sprouts are among the most common. Most grow within days of starting them, and can be eaten raw, juiced, or added into many dishes for a crunchy, flavorful bite. Although many people recommend canning jars, which are naturally wide-mouthed to make it easier to pour in the food to be preserved, you don't need to buy expensive new equipment to start sprouting seeds. You can use recycled materials. Jelly or jam jars, pickle jars, or similar containers can all be converted to use as sprouting containers. Always wash these jars with warm, soapy water and rinse until there's no trace of the original food. Do not put jars in the dishwasher! The heat may crack or break the glass. Always wash by hand. Soak the jars in warm water if you wish to remove the labels. The warm water will soften both the paper and the glue. Other ideas for using recycled materials include Styrofoam cups, plastic cups, and similar materials. Just be sure that whatever container you choose was originally intended for use with food products. Glass and plastic are the safest materials, with glass preferable to plastic. If you're still at a loss as to how to start seed sprouting and wish you had a plan or a blueprint, the following resources will help you get started. Living Foods: This website for raw and vegan food lovers containers detailed instructions for novices at seeds sprouting. While you're on the site, check out the other resources for vegan foods. Jason's Homestead shows you pictures of his own sprouting setup using Styrofoam cups and what looks like recycled cups. It's an easy guide with pictures to help you understand each step of the sprouting process. Happy Juicer provides a detailed introduction to sprouting for health. It includes reasons why sprouted seeds are good for you, step by step instructions for making a seed sprouting container, and resources for sprouting. Homestead.org also offers a detailed introduction with more ideals for seed sprouting containers, especially using recycled cartons and containers for seed sprouting. Sprout People: If you absolutely cannot figure out seed sprouting, Sprout People can help. Not only do they include detailed information, they also go through each type of sprout and share with you recipes, how-to articles, nutrition information and much more. Sprouting seeds offers a healthy way to get fresh vegetables even if you live in a tiny city apartment and it's the dead of winter. You don't need fancy containers or plans. Just use a bit of time to find some containers, purchase sprouting seeds, add water and get sprouting!